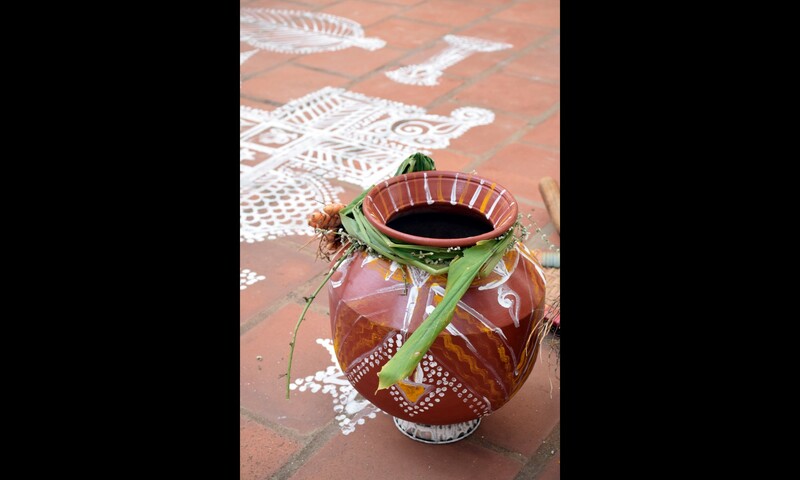 Pongal is the one of the most important festivals in Tamil Nadu. Also called Thai Pongal (for it inaugurates the Tamil month Thai), it begins on the 14th of January and lasts for four days. The popular and traditional occasion for showing gratitude to the sun god, Surya, and for celebrating the life cycles that provide grain, it is celebrated with great fervour as a thanksgiving ceremony for the year’s harvest. The word Pongal means “overflowing” or “spilling over” in Tamil, a reference both to the underlying significance of the holiday (the “overflowing” or abundance of the harvest) and to the rice dish (pongal) specifically cooked for the occasion in clay pots: the milk used for cooking the rice is heated until it “boils” or “spills over,” denoting future prosperity for the family. In January 2014, I was invited to celebrate Pongal in Mallangudi, a small village about 15 kms from Pudukottai (look it up on Google Maps!) where I had been a frequent visitor since 2006. I decided to keep a detailed journal recording the events of each day along with my reactions, emotions and observations living alongside my village friends and celebrating with them this most auspicious time of the year. I had decided to call this piece “Four Days in Mallangudi” before my adventure began. And though I was asked to and did stay an extra day (hence “Day Five”), I have kept the original title, due less to mental laziness than the desire to remain loyal to my first feelings of expectation and excitement.